To find out more, or to purchase any of the products below, please contact us. 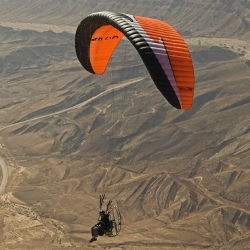 For more information regarding paramotors please call, or alternatively visit us at our training field. AXB are the UK importers for APCO Aviation. APCO have a large range of wings, harnesses, and other accessories available. See Apco Aviation for more information on products they have avaliable. 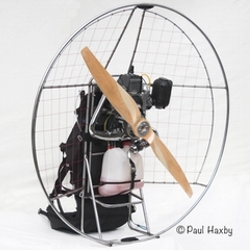 AXB do have various wings avaliable for demo, please call to arrange a test flight. 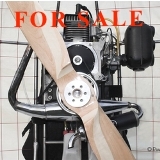 Gin Bolero XL - 2006 - Blue, Orange & White - Very good condition £900 (paramotor risers fitted with paraglider risers). Please contact us for more information. Paramania Revolution Large/28 - 2007(?) - Blue, Orange & White - Good condition £900. Please contact us for more information. Apco Thrust Medium/29 - 2009 - Blue & black - Excellent condition - £1400 (dual attachment points with trimmers). Please contact us for more information. Apco Vista Medium/28 - 2009 - Black, Grey & Yellow - Very good condition £800 (dual attachment points with trimmers). Please contact us for more information. Apco Prima 3 Large/30 - Blue & White - Good condition £450 (dual attachment points with trimmers). Please contact us for more information. Apco paramotor harness XL - 2009 - Excellent condition £200. Please contact us for more information. Please contact us by email for a list of the second hand paramotoring equipment we have available.